Hanging Accessories Included: Chain-3.125", Wire-120". This fixture can be adjusted for overall height. Making a statement without overpowering the surrounding decor, the Dunning lighting collection by Sea Gull Lighting is a chic addition to a wide range of interiors. 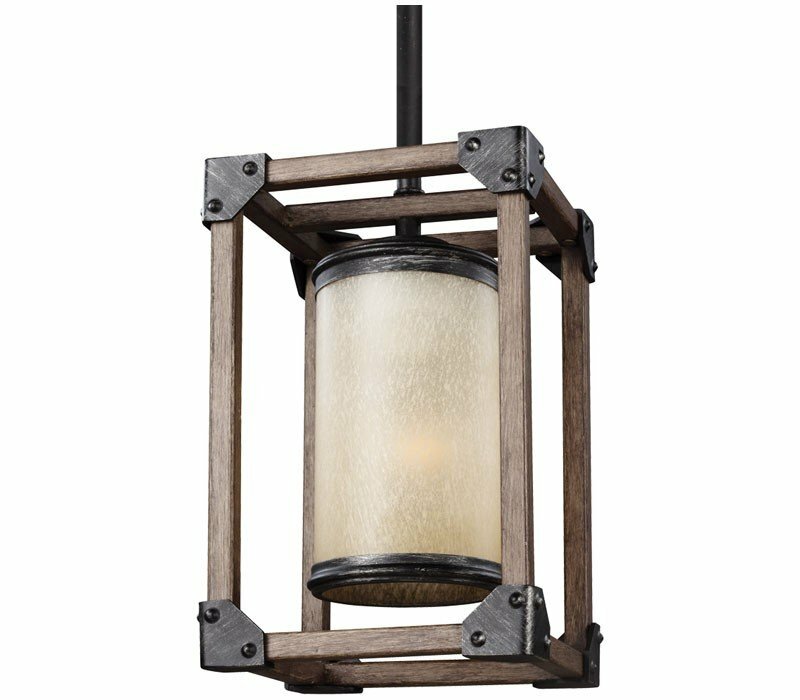 The bold design is inspired by farmhouse influences seen in the rustic rope detail highlighting the open, square frame which surrounds medium based lamps covered in Creme Parchment glass shades. The Dunning collection features a unique two-tone finish of Stardust on the overall metal structure, with the open frame in Cerused Oak finish which is created when a subtle white pigment is hand-rubbed into the surface to bring out the natural variations and contours., The full lighting collection features a five-light chandelier; a four-light island chandelier; a two-light flush mount; and one-light, two-light, three-light and four-light bath fixtures (all of which can mount up or down). Both incandescent lamping and ENERGY STAR-qualified fluorescent lamping are available. The Sea Gull Lighting 6113301-846 Dunning collection Pendant Lighting in Stardust / Cerused Oak uses Incandescent light output and brings Contemporary style. This item is 9.5"H x 6"W x 6"L. The wattage is 100. The Sea Gull Lighting 6113301-846 requires 1 bulb (not included). Additional Information: Shade-Creme Parchment Glass.